The first cohorts for the new linear Maths A-Level exams are well over halfway through, so our attention is now turning to how best to prepare for the upcoming exams. 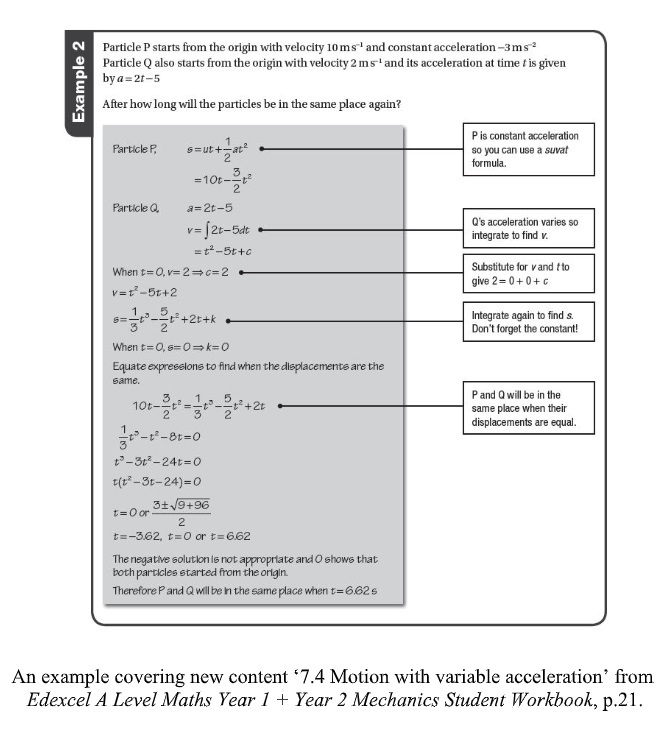 I’d like to reflect on some of the changes in A-level Maths that I think we should all be aware of during our planning. One of the biggest changes in the new A-level is a much greater emphasis on questions that model real-life scenarios. You may find that your students are confident in using a model which has been provided, but remember, they will also need to be able to formulate their own model given some ‘real-life’ information. 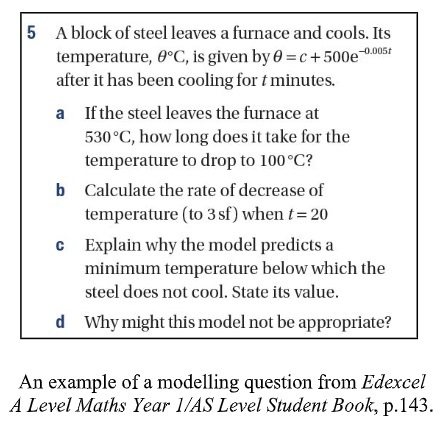 Modelling questions can relate to almost any topic in the specification, so I think it’s important that you get your students attempting modelling problems throughout the whole A-level course – don’t leave it for revision time! Here are a couple of examples of the sort of questions I suggest you ask, to develop your students’ problem-solving skills and their ability to formulate a model. 1 . A golf ball is hit from the tee and travels a horizontal distance of 120m. The ball just clears the top of a 30m tree which lies 50m from the tee. The path of the ball in the vertical plane is modelled by a quadratic equation. a) Form an equation to model this situation which links the height, h, of the ball above the ground, and the horizontal distance, d, from the tee. b) State a limitation of the model. 2 . Deer in a park are surveyed annually to establish the size of the population. The rate of increase of deer in a park is modelled as proportional to the size of current population. After 2 years, the size of the population is found to be 60, and the rate of increase is 5 per year. a) Formulate a differential equation to model the rate at which the number of deer is increasing. You must define your variables. b) Explain why this model will eventually break down. Finally, I can’t finish this section without a note on the importance of reading the question carefully: failing to appreciate the units being used in a model can lead to some rather non-sensical solutions! I think it’s fair to say that written answers have always proved troublesome for some students. Sometimes this is due to not understanding what the question is looking for (for example, ‘interpret’ means the answer should relate to the context of the question). At other times it can be a failure to express themselves in a coherent way. I suggest you try to provide lots of opportunities for students to answer these sorts of questions (the statistics topics are a particularly rich source of material to base them on). Encourage clear and efficient explanations; you could use peer assessment or exemplar solutions to help students understand what a good answer looks like. The introduction of a large data set is another big change; make sure your students are familiar with the one for your exam board. I’ve used a wall display to highlight the most important features of the data set, in the hope that something might stick in their mind! Maybe you could try to include at least one question based on data each statistics lesson? There are plenty of these questions available in textbooks and online, and students could even write their own! It’s crucial that your students all have a suitable calculator for these exams, calculators used by students in previous years are unlikely to be suitable. I love my Casio FX-991EX (and no, I’m not being paid by Casio to say that!). It has all the functionality required for both Maths and Further Maths, is easy to use, and half the price of the cheapest graphical calculator! Whatever they have though, check it fulfils the minimum requirements of your exam board and make sure the students (and you!) know how to use it. On the topic of calculators, students do need to be discerning about when and how to use them in the exams. If a question states, for example, ‘show’ or ‘use algebra/calculus’, then it probably isn’t appropriate to use the calculator (except perhaps to check their answer). However, there are other situations, such as when dealing with binomial or normal distributions, or calculating standard deviation from a frequency table, when calculator use is highly recommended, if not essential. There are some topics that, depending on the exam board and modules your students have studied in previous years, may be new to your schemes of work. For example, differentiation from first principles, the Newton-Raphson method, proof by contradiction and potentially several of the Statistics and Mechanics topics. So ensure you’re using up-to-date textbooks and resources and consider team-teaching these new topics where possible so that expertise can be shared between colleagues. Also, consider using any teacher guides that are available, and look at your exam-board’s website for advice and exemplars. The grade boundaries for the first exams in the new AS and A-level Maths were, unsurprisingly, very low compared to those seen in recent years under the modular specification. My guess is that these will increase significantly over the next few years as we get better at preparing our students for the exams. Have a think about what you can do to get ahead of that curve! Katie Wood combines her part-time work as a Maths teacher in Surrey with authoring for Oxford University Press and marking exam papers for Edexcel. She also has two primary-age children and is a school governor.